Three hours with no intermission, in a venue that doesn’t allow alcohol. “Jesus, if you’re yawning now you’re going to have a hard time in three hours,” Nick Cave quipped to one punter early. 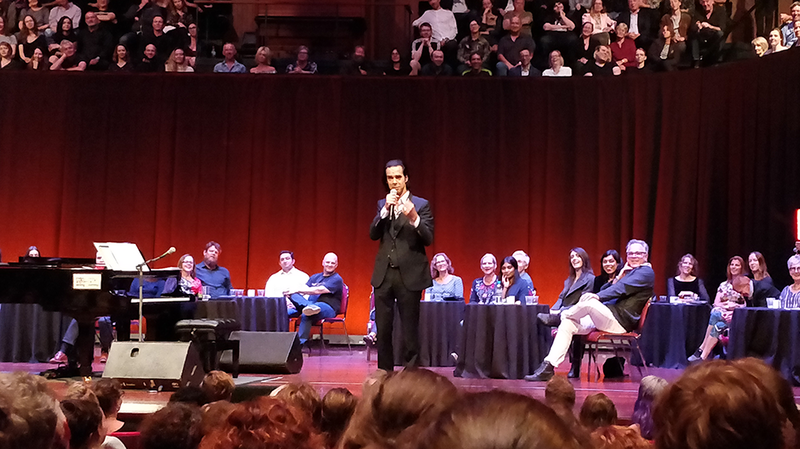 For a Nick Cave fan with the opportunity to ask their idol questions, God was in the house and it was always going to be a heavenly experience. Understandably, anyone else might have wondered if it would be worth it. It never dragged for a second. In fact, it’s hard to imagine anyone leaving feeling anything less than immensely thankful for the opportunity to see one of Australia, and the world’s, most unique artists in such a naked, vulnerable and intimate setting. The Conversations tour saw Cave perform songs solo at a grand piano, surrounded by fans seated on the stage, behind the stage – anywhere a chair might fit, in other words (the show reportedly sold out in a matter of hours). But the songs really played second fiddle to the main event, which was questions asked by audience members and Cave’s revealing responses. It got off to a cracking start with one lady asking what really happened with ex-partner PJ Harvey – in no time the crowd was in stitches as Cave recalled Polly Jean was a “very decisive woman” who effectively dumped him quite suddenly. The laughs continued thick and fast with a Cult of Nick Cave fan club member introducing conspiracy theories and demanding a hug. Nothing was off limits as Cave maligned his own Nocturama album, waited patiently on choked up fans, turned grief counsellor, spoke fondly of the intensity of collaboration with former The Boys Next Door and Birthday Party bandmate Rowland S. Howard, and even touched on his close friendship with Michael Hutchence (“I was jealous of his success; he was jealous of my credibility”). Insights ranged from his apparently fractured relationship with former right hand man Mick Harvey (hinted at several times), his ongoing dialogue with late son Arthur (who died suddenly aged 15 in 2015), his stance on touring Israel, and his favourite ever concert being an early Saints tour to Melbourne. Into My Arms was revealed to have been written on “Day 14” in rehab, and Cave used it as a segue to perform his popular love song. More often than not, these numbers seemed designed to give Cave a break from talking. There was less care put into building the set with songs than previous visits, giving the night a more patchwork feel, as if anything might happen. While favourites such as The Ship Song and The Mercy Seat sounded similar to versions we’ve heard before, there was magic in the simple rearrangements of Higgs Boson Blues and Papa Won’t Leave You, Henry, giving us a rare look at the songs in their most basic form. Finishing with a veritable sales pitch for meditation app Waking Up with Sam Harris, Cave revealed he’d been meditating for five years, and despite his recent hardships it’s obviously working for him. He’s an inherent optimist, who argued, “It’s the audacity of us humans to do incredible things that fills me with optimism”. And when a young man in the crowd, recently introduced to early Birthday Party videos through YouTube, asked where all that early energy on stage came from, Cave was quick to say, “Meditation!” (refer to earlier paragraph about rehab). The ‘conversation’ ended with the crowd in stitches, just as it had begun. 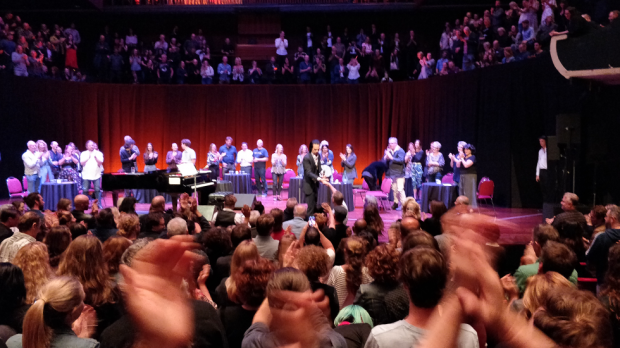 He then took a trio of requests, of which Breathless and God is in the House were among the standout numbers of the night, and left to a standing ovation. “See you next year!” he said on his way out. And why wouldn’t you see this living treasure every chance you get?